Greetings from post-Brexit-vote London. I have been in the UK and Ireland for the past couple of weeks leading up to the Brexit referendum, the vote, and the immediate aftermath. The results were announced Friday morning in a surprise for many, with “Leave” being the ultimate choice of 52% of the voters. I happen to be here at this historic time by coincidence. I just spent two wonderful weeks in Ireland and Scotland with Lori and our children. They are now back in the Bay Area and I’ve arrived in London to give several talks and take a number of meetings this coming week, including addressing London bankers and entrepreneurs, along with our UC Berkeley alumni in London. What a fascinating time to be here and see history happening. Or un-happening as the case may be. The response this weekend as the reality of the voting results washed over the UK (and also the EU and rest of the world) was one of shock and surprise here, especially since the early returns the evening before had “Remain” winning (see attached picture I took of a Scottish paper predicting the wrong result, and the second paper highlighting that 86% of bookies predicted a Remain victory). 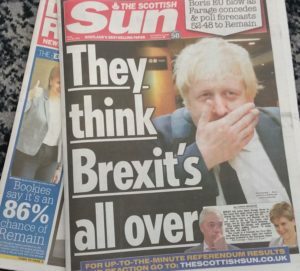 Hints of “Dewey Beats Truman.” Scotland paper gets the Brexit results wrong in their election day edition. There were many reports of voters who said they voted Leave as they wanted to send a clear message that change was needed, but never thought the Leave side would win. There are already number of surprised Leave voters who said if they had thought Leave would win they would have voted differently. It’s clearly too early to offer a detailed perspective on what this ultimately means for the UK, EU and beyond, especially when it comes to entrepreneurship and innovation where I focus. The British Prime Minister David Cameron – who brought about this vote in the first place obviously expecting a different result – has resigned. And the UK/EU separation process will take at least 2+ years to play out, with no immediate regulatory or logistics changes expected. There will obviously be major implications with regard to talent, markets, and capital, and many other new challenges. I expect that some of the initial shocks we’ve seen such as large exchange rate shifts (its a good time for those of us with US $ to shop in London) and equities market volatility will settle down. As the Brits famously said in WW II: “stay calm and carry on.” We will all use the next few weeks to take stock from business, personal and political perspectives. I certainly hope to have a better sense from my time and discussions here. While pessimism understandably runs rampant in the business community, allow me to offer a “glass half full” viewpoint; a perspective I be sharing in my talks this week. Great entrepreneurs and innovators find and create great opportunities in times of major change, challenge, uncertainty and disruption. Right now we have just such a moment. Conversely, those who do nothing typically pay the ultimate price. So now is not a time to fear failure (a la my book “Other “F” Word”) , not a time to put your head in the sand and do nothing. Now is a time for thoughtful action. To think about scenarios and options. To inspire your people and teams to think creatively about addressing new and evolving needs and problems. To invest more heavily in innovation, even if that means a number of little bets for now. To think about the implications of the coming changes and how to turn those into new opportunities, new ventures, new initiatives. One a more local level, I was in Scotland when the Brexit vote results were announced, and wanted to share a perspective that probably doesn’t get much attention outside of that country (and especially outside the UK). The Leave results were clearly not well received in Scotland, with the Scots being understandably upset for several reasons. First of all, on the Brexit referendum, they voted heavily (62/38%) to remain in the EU. Second, in their own Scottish independence referendum from the UK in 2014 – which resulted in them remaining a part of the UK with a 55/45% vote – the result was heavily influenced by the promise of staying within the EU. In fact, many pundits believe that the EU membership was the deciding factor in that referendum. Now Scotland feels doubly betrayed by this Brexit result and there is renewed interest in Scottish independence. In fact, Friday morning when the results were announced, Scotland’s First Minister Nicola Sturgeon gave a public address and clearly signaled that another Scottish independence referendum should be expected. And then of course there are the broader European/EU concerns that the UK is the first domino – and a very large and loud one at that – to fall in the weakening or possible eventual dissolution of the EU. Political leaders in a number of EU member countries have already expressed in following the UK out of the EU. Sweden, Denmark, Hungary, The Netherlands, Greece and even France, among others, are potential followers here. The other perspective is that this loud wakeup call to the EU may result in needed action from EU political leadership in Brussels (see my recent post regarding a recent talk I gave to a group of EU Parliament ministers). One can only hope. What a fascinating, historic time to be here.